Like Taylor Hawkins of Foo Fighters and Liam Gallagher of Oasis, female rocker Brody Dalle of The Distillers/Spinnerette had to cover up a name tattoo of an ex-lover. Dalle married Rancid lead singer Tim Armstrong in 1997 at the age of 18. Dalle even had a heart tattoo with her husband name (TIM) and the words “Everlasting” on the right side of her back. They stayed married until 2003 when Armstrong saw this photo of his wife in Rolling Stone Magazine’s “Monsters of Summer Rock” issue making out with Josh Homme of Queens Of The Stone Age. Dalle and Homme began dating and married in 2007. The “Tim Everlasting” tattoo was obviously covered up. 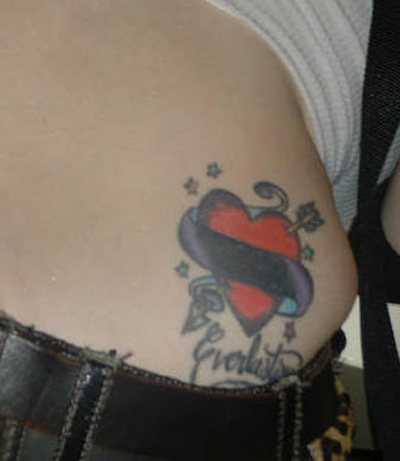 The covered up tattoo was even featured on the back cover of her 2009 debut album for her band Spinnerette. Homme and Dalle have two kids and seem to be living happily “everlasting”.